Originally released on 08/01/2005, this is a newly remastered movie with 58 new minutes of discovered footage including some unique color film. 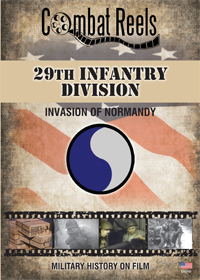 This is a DVD of the 29th Infantry Division, also known as the 'Blue and Grey', one of only 4 American Infantry Divisions used in the invasion of France on June 6th 1944. The division would have the responsibility of invading an 'Omaha Beach' sector on one of the bloodiest days in American history. This Invasion of Normandy film shows the actions of the men of the 29th Infantry Division as recorded by the 165th and 166th Signal Photo Companies, during the historic operation of the Normandy landings that started on D-Day, 6 June 1944. Combat Reels has researched and compiled all of this raw combat film footage, then reformatted it into the DVD format for your viewing pleasure. The military history footage in this video is intended to be strictly that of the 29th Infantry Division and only shows other unit footage when two or more units are intertwined. This video contains footage covering the time from June 2nd, to the first of August 1944. Great for veterans, families, military historians, researchers and enthusiasts, some of the images included on this DVD video are soldiers of the 29th Infantry Division aboard ships as they go over maps and receive final instructions for the invasion. Then, D-Day, see the men loading equipment and vehicles onto invasion craft headed for Omaha Beach and men rescued from a wrecked landing craft. Men of the 29th liberate small port towns like Isigny, as medics take out wounded. Men of the 29th Division fight in the hedgerows to liberate St. Lo. Tank mine sweepers and engineers remove mines from roads near the town of St. Lo. General Montgomery visits the Commander of the 29th Division, General Gerhardt, and General Bradley presents awards to men for their gallantry in Normandy. German POWs are searched and processed by men of the 29th and medics tend to casualties. There are also shots of the division at rest, relaxing in fields and hedgerows at a Red Cross Clubmobile. Finally scenes of a cemetery in Normandy that has been dedicated to fallen soldiers of the 29th Division. Order your copy today and enjoy these and many more up close shots of equipment, vehicles, weapons, uniforms, helmet markings, and of the faces of the men of the 29th Infantry Division themselves on these candid movie film reels of history, presented to you on popular DVD formatted video!